Labor day weekend was an exciting one, full of trail camera card pulls and dove hunting fun. It was my last trail camera check on my North Carolina hunting properties before Thanksgiving week, which coincides with the best rut hunting of the year. Here are my top hitlist bucks for this year, some of which we talked about during the podcast last week! My number one hitlist buck this year at my house is “turd.” He earned this name over the last two seasons because he had below average antlers for his age and the area I hunt in. However, much to my excitement he has blown up this year and doubled in size. (Above) Turd’s small antlers at 1.5 and 2.5 years old earned him his name. Notice the notch in his right ear that I have used to track him from a yearling to 3.5 this year! Last year I passed on this buck cruising twice during my annual Thanksgiving week hunting vacation. I am very excited this year at the prospect of having an exceptional 3.5 year old like him around! 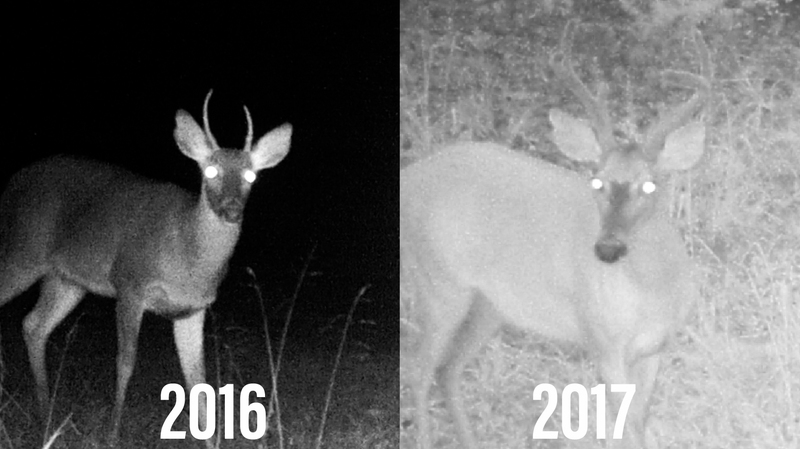 (Above) Turd has blown up this year and turned into quite an impressive 3.5 year old, especially considering his antlers in past years. Last year 7-up was a wide 2.5 year old six pointer that roamed my hunting properties at my house. I passed on him during Thanksgiving week as he chased a doe past my stand late one morning. Coincidentally, this was the same stand I passed turd up from and I will definitely be trying to hunt this same stand this year if I get the right wind directions. Named after the one and only after he passed him as a half rack 2.5 year old in 2016. This buck was my top hitlister on my urban hunting property last year as a 3.5 year old. I had one solid opportunity at him on December 16th, but I blew my chance because I hesitated to shoot at first while sizing up his body characteristics to confirm his age. When I finally decided to shoot, I felt rushed and screwed up what would have otherwise been an easy 30 yard shot. Mark has not put on many inches in the antler category this year, but he has put on some mass and is a respectable 4.5 year old that would get my blood pumping and make me ecstatic to harvest. On November 16th last year, while hunting my urban hunting property, I had a prime opportunity at Strappy but I aimed a little too high on his body and he ducked my arrow. My first thought was that I had missed him completely but after inspecting the arrow I found a drop of blood on the fletching. I had just barely backstrapped him (earning the name “Strappy”) and I began getting photos of him again shortly after. 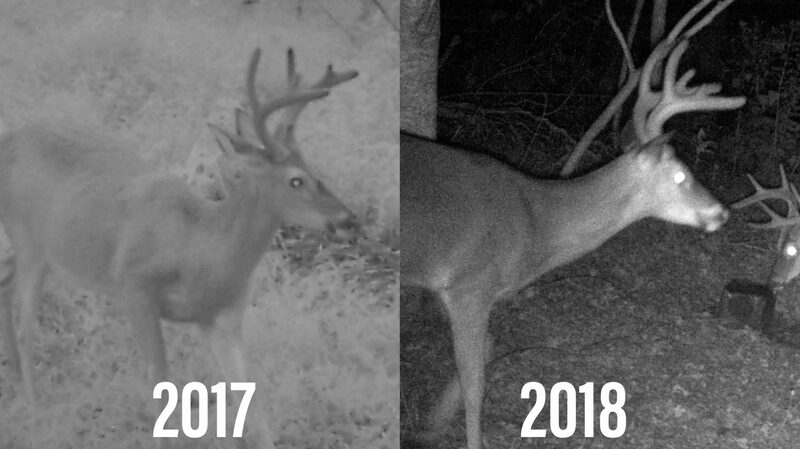 He has shown back up for 2018 and has not grown much at all in the antler department. However, he is another hit list buck that I believe is 4.5 years old! 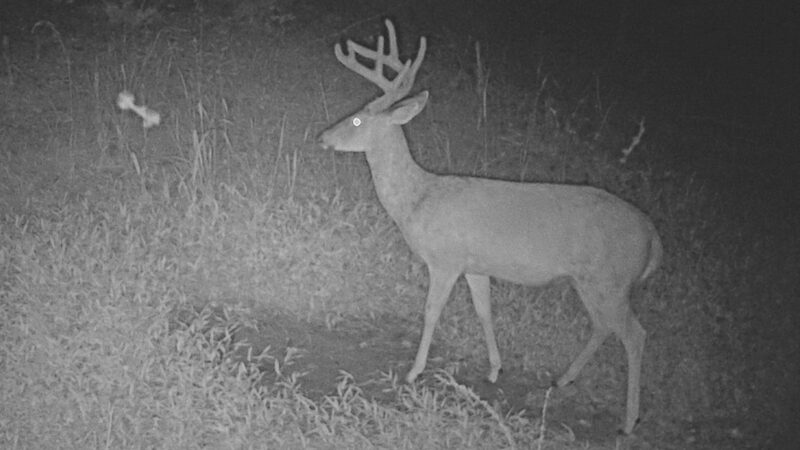 (Above) Strappy has not grown much from last year, but he is a mature buck and would be a trophy! This buck was all over my trail cameras in town last year as a 2.5 year old. He had very unique antler characteristics with small brow tines and an overall tall rack. This year he is back and he has put on considerable mass and main beam length! I do not currently have a name for this deer, so any solid name suggestions would be appreciated! (Above) I need a name for this deer, please help! 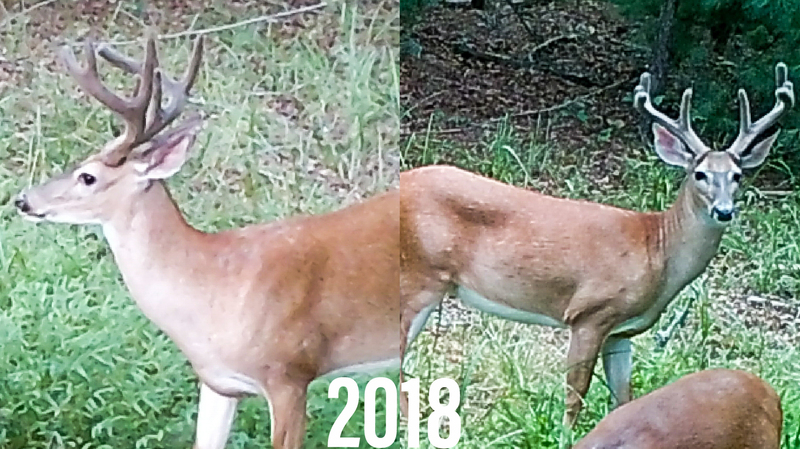 On the property near my NC home I also have two more shooter bucks that have shown up on camera a few times. 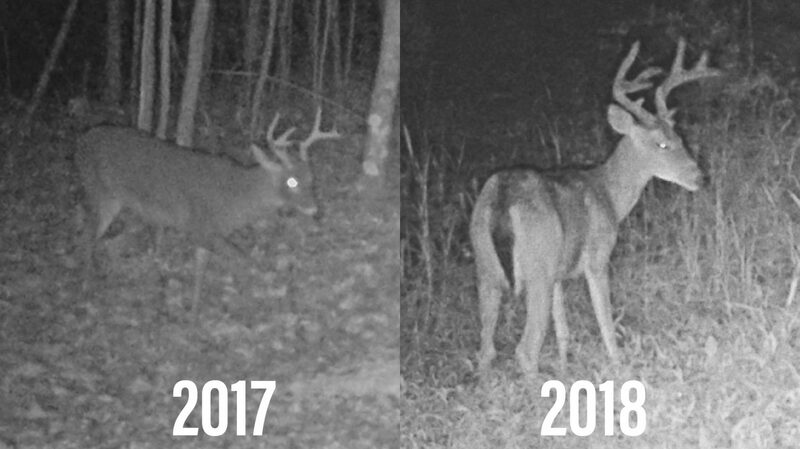 The first is a very unique 8pt that has a curved brow tine on his right that angles forward and a main beam that is much shorter than his G3 on his right side. 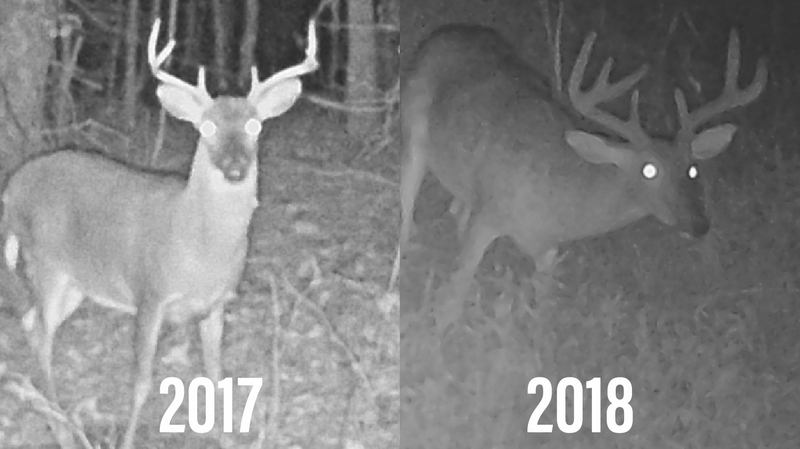 I had photos of this buck during late season in 2017 when he had a smaller frame but the same overall antler conformation. This deer also needs a name, if anyone has good suggestions! (Above) This mystery buck was not on my camera much last year, maybe this year will be different. The other shooter buck on camera at my house is a large 9 point with a tight frame. 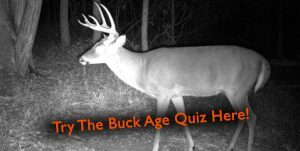 His body is characteristic of a fully mature buck and I believe he is at least 4.5 years old if not older. 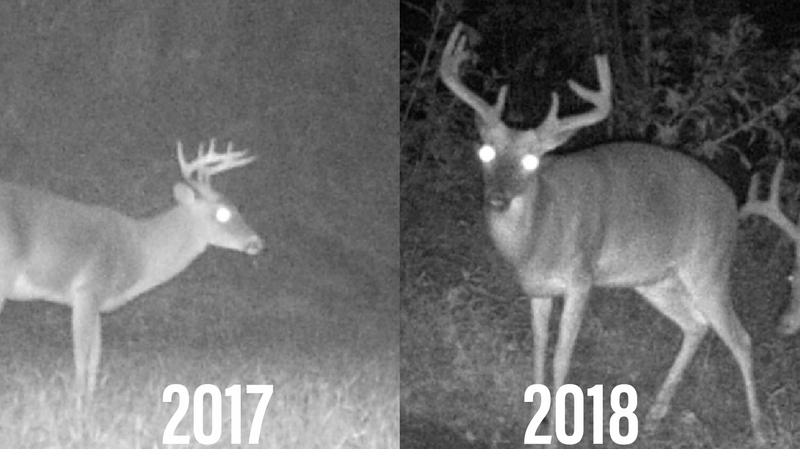 Because I am not positive that this buck has been on my cameras during hunting season in the past, I am not putting much confidence in having an opportunity at him this fall. But anything can happen in the deer woods! (Above) While I do not have any history with this buck that I am aware of, I am excited to know he is in the area! With a great crop of shooter bucks gracing my cameras this year, I am excited for fall to say the least. Unfortunately, I will be limited in my NC hunting opportunity this year and will probably only be able to hunt there during Thanksgiving week and Christmas break. 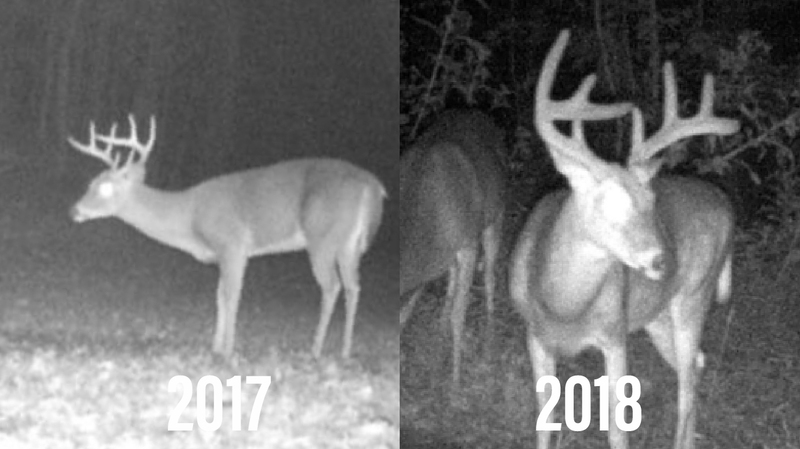 Luckily these two time periods seem to be my best opportunity at a mature buck based on hunting experiences from years past. Regardless, hunting season is here and I am ecstatic! See you all in the woods! Mark… The Deer looks like a lot of good meat. I think so, but truthfully any of them are prime candidates!